We had a bit of a lie in this morning and when we got up we checked the weather forecast for the day. It was due to be another scorcher and at least 4 degrees cooler at home. As a result we decided to pack up and head home, after packing up we had a quick coffee and then left at about 10.30am. 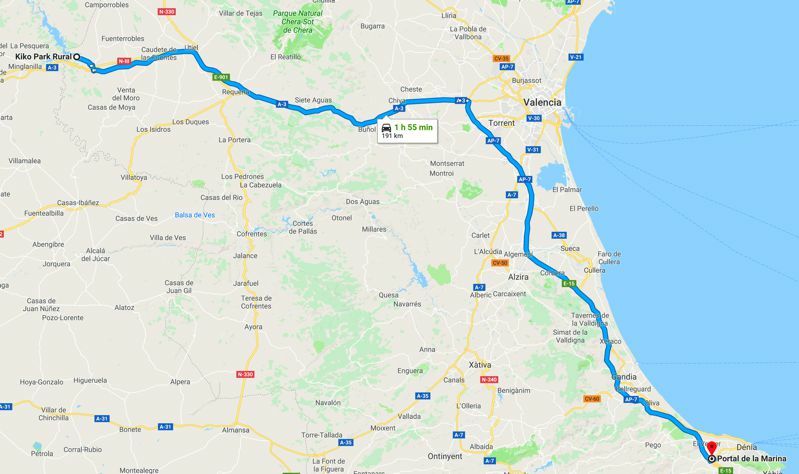 We went back through the village and then re-joined the A3 in the direction of Valencia, the closer we got to Valencia the busier the motorway got. We left the A3 turning onto the A7 heading south and towards home. On this section of the motorway we saw two other Adria motorhomes, the first that we had seen since leaving Caravanning Oyambre 10 days ago. We stopped at the service are north of Gandia for a quick sandwich and then continued down the A7 to Ondara. We stopped at the shopping centre and filled the tanks with diesel ready for our next trip and then headed home and were parked up by about 2.30pm. I walked home and collected the car and we unloaded the motorhome and took everything home and then had a refreshing swim in our own pool. We weren’t away for quite as long as we had intended and we didn’t visit all the areas we wanted to but we still had a very enjoyable holiday.